It is common for ecommerce shops and for trusted financial websites to use HTTPs encryption as this secure version of a website offers more security and helps protect the privacy of the users on the website. But it seems like Google is trying to shove the concept of HTTPS down to the throat of most webmasters. 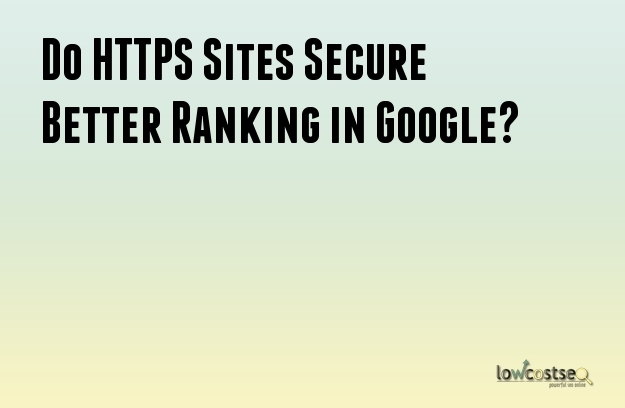 They have made it clear that sites with HTTPs encryption are going to get privileged when it comes to achieve better rankings. Now before we try to get to the bottom of this, allow us describe what HTTPS is all about. HTTPS encrypts the information that passed between the site and the browser and therefore offers protective cover for the users. Google has long been using https for most of their products, be it their search engines, apps site or Gmail etc as it believes it has a responsibility to make the web safe for the users. So, here we have a declaration from Google that sites with https encryption will enjoy better visibility in its SERP. Google has even incorporated this signal to its main algo and as far as the claim of the company is concerned, sites that will migrate from standard http to https will get benefited at the end. However, you can’t expect the impact to be as powerful as that of high quality content or lower bounce rate kind of things. This latest signal is a mild one and as Google says it is not going to have a major impact on the overall visibility of the website. Less than 1% of the search queries are going to get slightly influenced by this change and that means, if you don’t wish to see your website struggling to keep pace with other websites that have already made a migration to https, you need to embrace this change. Https increases the trust value of the website and reduces the trust deficit between the users and the website. This rings true for those sites that offer crucial medical or financial support. Moreover, since each website will be authenticated individually, the chance of impersonation will be next to none. The only way you can stop people trying to intrude on how the content of your website is getting served to your targeted audience is by opting for https version. Some networks include pop up ads along with your website and this can have an impact on the trustworthiness of your website. So, the matter of fact is that Google is pushing hard all webmasters to follow its dictate and by rewarding the website with https encryption code. So, if you don’t wish to leave out on this new opportunity, you need to do a proper planning to make a smooth migration of your website from the standard http to the more secured https version.